BFW Rescue is a Bernese Mountain Dog Rescue with fosters and adopters all over the USA and Canada. We rescue Berners from shelters or puppy mills and also help families when they have to re-home their Berners. Sometimes life throws you a curve and you have no choice to give your Berner up and this is where we can help. We will find the best new home so the Berner does not end up in a shelter. Don’t Be Cruel offered to do this fundraiser for us and we so appreciate this. The fundraiser will run from March 1st until March 31st. Please check out the store, every penny will be going to our rescue. Thank you so much. Without your help we couldn’t be doing what we are doing and thank you Jason Long for doing this for us! This entry was posted in Animal Rescue Organizations and tagged Bernese Mountain Dog Rescue, BFW Rescue, Christa Duff on March 2, 2014 by Christa Duff. Thanks to everyone who purchased from our web store, we are proud to announce that Don’t Be Cruel sponsored Henry the Goat from for the Animals Sanctuary in the month of April and will continue to do so in May. Henry was a neglected pet. An elderly couple had gotten Henry to keep as a pet in their backyard. After feeling that he was a bit lonely by himself, they got him a companion named Pippin (who was also living at for the Animals sanctuary but unfortunately passed away earlier this year) and they were immediately inseparable. Unfortunately, the husband and primary caregiver passed away and his wife was no longer able to keep them healthy. Goats in captivity need their hooves trimmed every 4-6 weeks. Henry’s hooves were overgrown and becoming painful to walk on. He began limping and eventually crawled on his knees, as he was no longer able to bear weight on his hooves. The elderly woman contacted for the Animals sanctuary and they took Henry and his brother Pippin into the family. 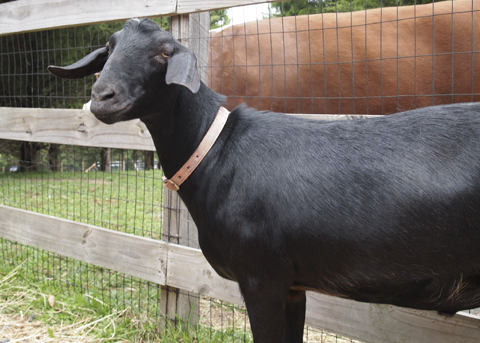 Henry is an extremely outgoing goat, and is often the very first farm animal to greet you when you come for a visit. He loves munching on evergreen sprigs trimmed from the trees on the sanctuary property. The for the Animals Sanctuary is a non-profit organization dedicated to food, bedding, and medical care for farm animals and is located in Blairstown, NJ. 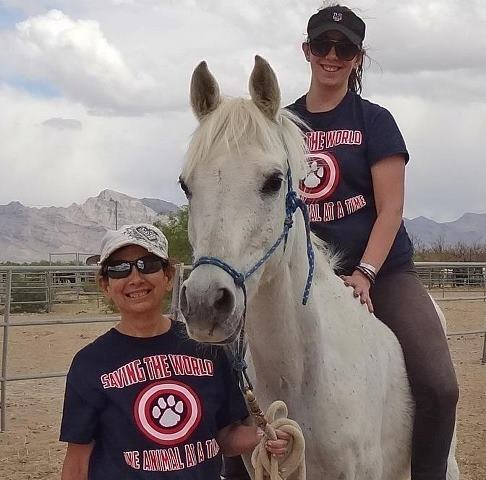 Debbie Kowalski, the sanctuary’s founder, has devoted most of her life to helping people and animals. She is a full-time critical care nurse, in addition to being the only live-in caregiver to the animals. She works day and night to sustain the sanctuary and provide medical care to our injured animals. You can sponsor an animal by visiting their Meet the Animals page. Just click on one of the categories to meet their cows, pigs, goats and chickens. 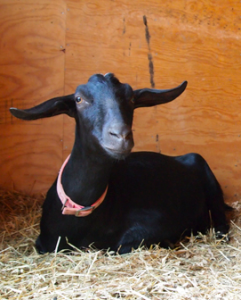 This entry was posted in Animal Rescue Organizations and tagged For the Animals Sanctuary, Henry the Goat, rescue farm animals in NJ on May 1, 2013 by Belkis Cardona-Rivera. Set back from the road away from neighbors and passers-by is an 11-acre wildlife refuge. On a recent morning, several raccoons playfully jumped over one another in a cage next to opossums. In a room next door, a black bear cub recovering from surgery sat in a cage to herself. She rattled the bars, growling, as the executive director tried to open the door to the cage. Tracy Leaver, along with two staffers and an army of more than 40 volunteers, operates the Woodlands Wildlife Refuge, a nonprofit animal rehabilitation center that is dedicated to the care and release of orphaned and injured wildlife. The refuge takes in about 800 animals each year and has as many as 120 in its care at one time, providing a temporary home to bears, squirrels, foxes, raccoons, opossums, otters, woodchucks, minks, turtles, porcupines, bats, coyotes, rabbits and bobcats until they grow up or return to full health. “Our job here is to simply give the animals a second chance,” Leaver said. Woodlands Wildlife Refuge, which receives no state or federal funding, relies on donations to operate. It started 26 years ago when Leaver found two orphaned raccoons, and it grew from there. The refuge, which works closely with the state Division of Fish and Wildlife’s black bear project team, is the only one in the state that is permitted to take in bears, in part because the demand is low. 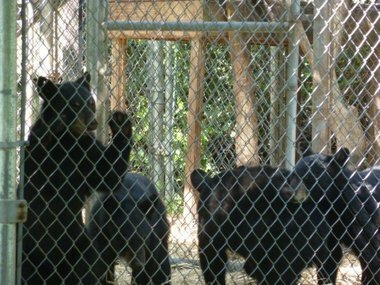 Over the years, the refuge has cared for 72 bears, mostly abandoned or injured cubs. Read more at N.J. wildlife refuge gives injured, orphaned animals a second chance | NJ.com. This entry was posted in Animal Rescue Organizations and tagged Division of Fish and Wildlife's black bear project team, N.J. Wildlife, Tracy Leaver, Woodlands Wildlife Refuge on August 14, 2012 by Belkis Cardona-Rivera.